Dr. Long is a board certified gynecologist with a special interest in bioidentical hormone replacement and female sexual health. She is passionate about proactive and preventive medicine, and seeking wellness before being found by illness. Dr. Long graduated from the University of Virginia School of Medicine and completed her Obstetrics and Gynecology residency at the University of Florida in Jacksonville. She completed a preceptorship with Dr. Jennifer Berman, a pioneer in the field of female sexual health, at her Rodeo Drive Center for Women’s Health in Los Angeles. She also has studied extensively with Dr. Neal Rouzier of the Beverly Hills Center for Anti-Aging Medicine, which focuses heavily on menopausal issues. 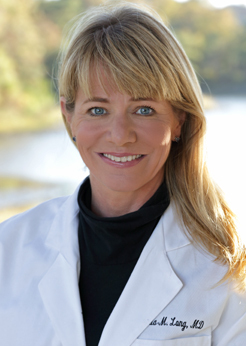 Dr. Long believes in the individualization of hormone therapy for each patient based on her unique needs and goals. Dr. Long has provided quality health care to women in Hampton Roads since 1996. • What is more important than your health? • Your body will not work right if you don't treat it right. • Only exercise on the days you eat. She is the mother of two children. In her spare time, she is an avid runner who competes in local races including marathons and half marathons. In 2010 she completed the Boston Marathon. Her other hobbies include horseback riding, travel, and shoe shopping.